The heart is a hollow muscular organ made of striated muscle that contracts and relaxes alternately. By the action of contraction and relaxation, the heart pumps more than 1 million gallons per year without stopping. The heart is located in the chest cavity (mediastinum) from the sternum to the spine, and between the lungs. The pericardium is a fibrotic sac around the heart and the roots of the large blood vessels. Divided into Fibrous and Serous. The fibrotic pericard is relatively strong. The Parietal layer is attached to the Fibrous pericardium. To limit excessive movement of the heart. Contains the pericardial cavity which contains lubricant to assist with the hearts contractions. The pericardium is not part of the heart, but an envelope around it, and therefore has no connection to the special electrical conduction system of the heart muscle. Therefore its connected to the body's nervous sytem via the phrenic, vagus and other nerves. 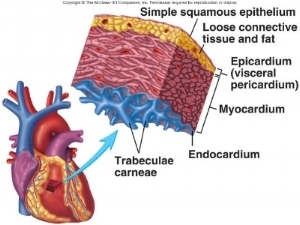 The blood supply to the pericard is via small specific arteries that come externally together with the phrenic nerve (with exception of the epicardial surface that recieves its supply through the Coronary Arteries). The muscle structure is less organised, It is built of muscle strips that split and mingle with each other. Cardiomyocytes have spontaneous self-contraction potential without the need for neural stimulation, as opposed to striated muscle. Specific muscle fibers form the conduction system of the heart. The heart muscle has autonomic nerve supply that affects the rate of contraction. The heart muscle lacks in the ability to regenerate after injury. This is the inner layer that forms the lining of all the chambers of the heart. It consists of endothelial cells forming a smooth coating that repels thrombocyte aggregation and thus prevents clotting in the cavities.